In what's called "The Last Supper," issue ten of 'Tomboy' delivers a tricky chapter that sets up an explosive confrontation. After so much intrigue and horror, Mia Goodwin has maneuvered her characters in what looks like a showdown. Things are reaching a tipping point as the D.A. looks to settle the score, Mark reaches out to Addison to thaw their chilly relationship and Irene Trent is forced into the open. Few secrets remain as issue ten lays down the gauntlet ahead. 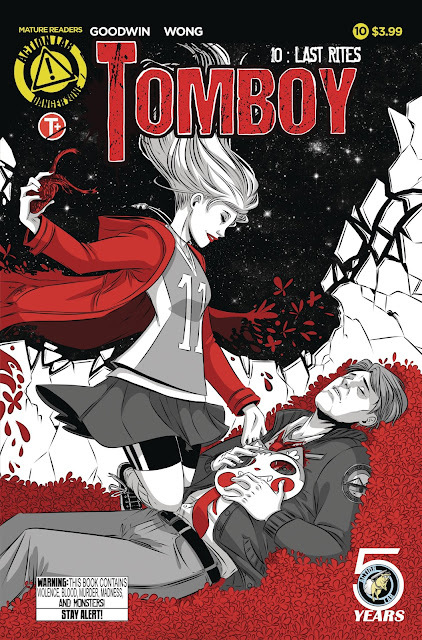 What makes this issue tricky is that if you haven't been following 'Tomboy' (and you should) then what's being set up may not make sense. I recommend getting caught up with Volume 1 and Volume 2 to see how far Addison has changed from happy teen to enchanted masked-vigilante killer. This dark magical conspiracy thriller has been leading to a reckoning at some point and that point is near. While there are a few moving parts in issue ten, at its center is the relationship between Mark and Addison. It has changed so much that their car ride is awkward and heartwrenching. Mark is desperately trying to reconnect with her again, admitting he let her down and wants to bridge that gap once again. Addison seems withdrawn, having been through so much loss and feeling that her dad was not there for her. She harbors her dark secret from him and any revelation would shatter their relationship once and for all. Meanwhile, the other players make their moves motivated by revenge, justice, betrayal, or guilt. One would assume the next issue should reveal and shed many demons. All the while, Michelle Wong continues to provide extraordinary artwork. Her clean lines and expressive facial expressions convey exactly what's on the characters' minds. Pain, sadness and an occasional smile tell the story in well-paced layouts that have helped make 'Tomboy' a must-buy. 'Tomboy' is reaching the climatic confrontation we've been waiting for. Issue ten sets that up while dealing with the emotional turmoil between father and daughter, the act of vengeance of another father, and the forces that might bring Irene Trent to justice. As always, Goodwin and Wong bring their best.